This six pitch rock climb (5.10a) on the south face of Prusik Peak leads to an airy summit in Washington's fabled Enchantments. 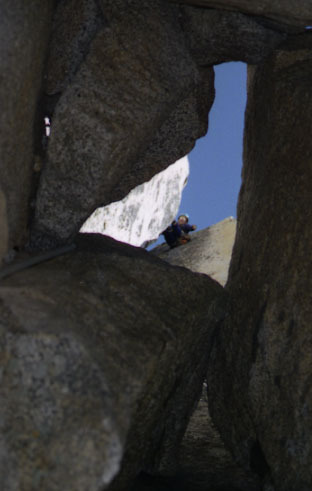 Fun climbing on clean granite, splendid scenery, and a south aspect combine to make this one of Washington's most pleasant alpine rock outings. The area is subject to a restrictive wilderness permit system, though, so on fair-weather weekends, you may not obtain a permit and you should be ready to divert to some other objective nearby or alter your game plan to undertake this climb as a day trip rather than the overnight that most parties prefer (the climb is 9 or 10 stiff miles from the road). A relatively full rack is required for this climb. Bring gear from 1/4" to 4" with a half dozen pieces in the 2" - 4" range, and several long runners. Two ropes are handy for the descent, but not absolutely necessary. The climb is in a high alpine area, so be prepared for intense sun as well as mountain storms: the Stuart Range has a way of generating bad weather even when other areas nearby are warm and dry. The climb can be approached from either the Mountaineer Creek trailhead or the Snow Creek Trailhead, both of which lie in the Icicle Creek drainage, west of Leavenworth, Washington. 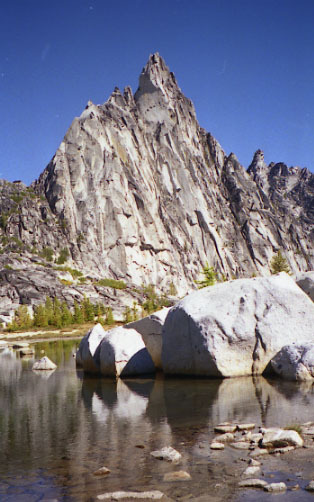 The Mountaineer Creek approach, preferred by most mountain climbers, takes you past the north face of Dragontail and up a climbers' path over Aasgard, then down through the highest part of the Enchantment lakes basin. The Snow Creek approach is probably slightly easier and certainly a better choice in poor weather. Both are about equal in distance and elevation gain. However you get there, the climb starts on a grassy bench about 1,000 feet above Lake Viviane. The South Face proper rises just to the right of a massive west (left) facing corner system that runs from the ground to the summit ridge and forms a slightly overhanging west or southwest face at the top. From the base of this large left-facing corner system, walk to the right and look for a boulder leaning against the base of the face, forming a	cave behind it. There are two deep chimneys just to the left and the climb starts immediately left of the left-hand of the two. The picture at left may help identify the route. The first pitch starts atop some blocks, with a crack up to 4" trending up and left (5.9). Approximately 50 feet up this crack, head up an inside corner system bearing slightly more straight up, past a small group of trees. 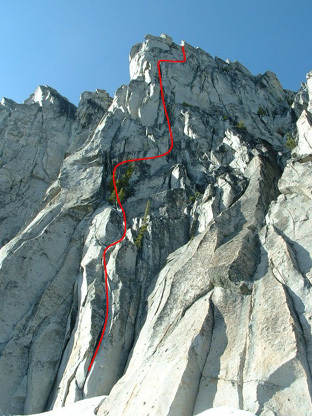 The second pitch starts with an inobvious rising traverse out right on awkward blocks and small knobs (5.8), reaching a vertically oriented crack/corner system perhaps 40 feet outside the first large corner system. The corner system you are headed for can be spotted from the ground before you start the climb: look for a long, continuous corner system that ends on a nearly horizontal ledge system to the right of the overhanging west or southwest face noted above. The large chockstone in the chimney on pitch 4 can be seen from the ground. About 200 feet up this corner system is a chockstone (squeeze), followed by a flaring chimney (5.9) that most climbers will not forget. The chimney is amply protected by a sling around a chockstone and there is often fixed gear here, but the moves are awkward and you'll be glad to grab the "thank god" holds that allow you to pull out of it. 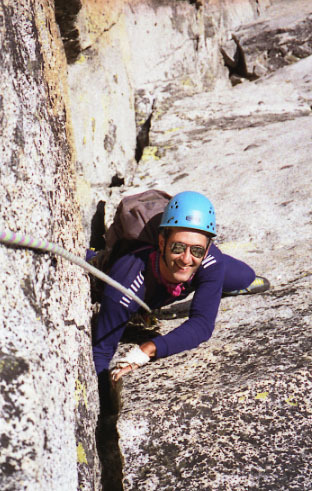 Above this, move up and right onto a large ledge system to set up for the final pitch. The last pitch follows a spectacular corner with another 4" crack (5.10a). The Burgner-Stanley route finishes right on the summit. Here, there are large flat spots to sun yourself, and in fair weather it would even make an ideal bivvy. To descend, rappel off the backside, 2 or 3 rappels, to a ledge system allowing a walk/scramble westward to the base of the West Ridge (another popular and classic climb, and one that is quite a bit easier than the Burgner-Stanley). Note: This route is amply described in the following guidebooks: Cascade Alpine Guide, Volume I, Fred Beckey; Select Climbs in the Cascades, Volume I, Jim Nelson and Peter Potterfield, 2003.